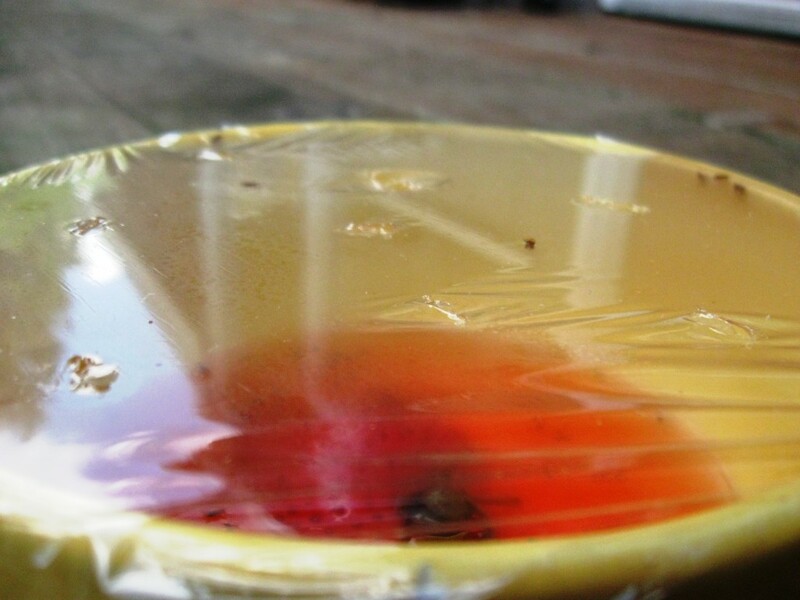 This simple trap is the best way to keep fruit flies under control. I can guarantee it works because I’ve used it myself many times and caught hundreds of fruit flies to date. The fruit fly trap will work with any piece of fruit – the riper the better. Place the fruit in a bowl and pour in apple cider vinegar. You don’t want to cover the fruit completely with the vinegar because the fruit flies won’t be able to smell the fruit as easily. I am using a strawberry because that’s what we have available at the moment. I have also done good trapping with tomato. You could use anything that you see fruit flies swarming to. Apple cider vinegar works better than common white vinegar because it’s less intense and the fruit flies don’t seem to be turned off by it as much. If you don’t have apple cider vinegar you can try with white vinegar with some wine or brown sugar mixed in. What makes the trap work is the plastic wrap, also called cling film, stretched on top. Poke a few small holes with a sharp knife in the center for the fruit flies to enter in. Just 5 or 6 holes is more than enough. The bugs will try to escape by crawling up the side of the bowl so make sure that you don’t put any holes right against the rim of your bowl. If the flies can escape you may want to stretch a rubber band around the side of the bowl to hold the plastic wrap in place. 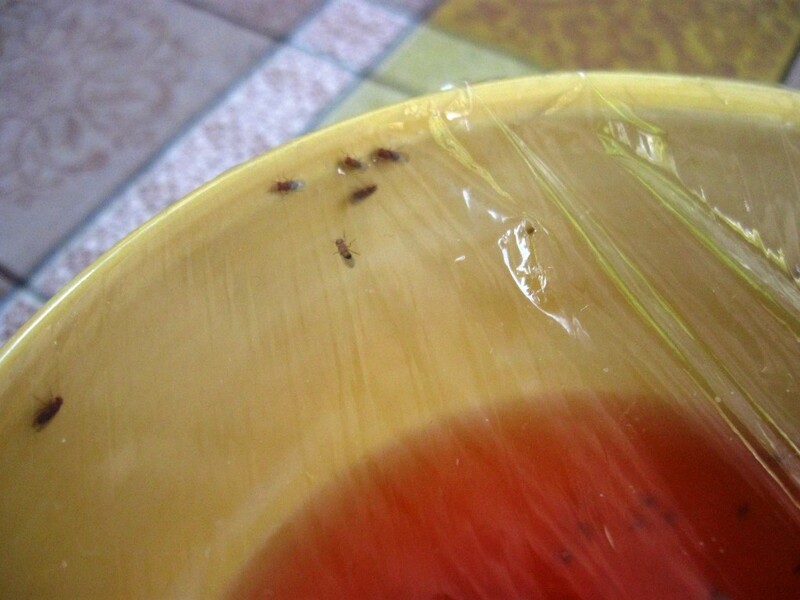 The instant the flies touch the vinegar just once – it’s game over for them. The fruit fly trap works slowly and surely. The trap I’m showing here only caught a few flies in the first few hours, but 48 hours later is full of them. 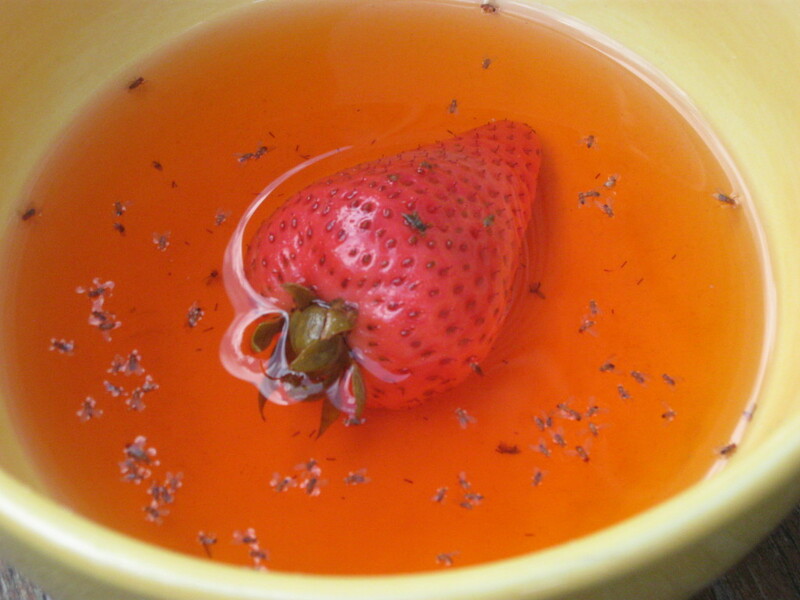 In fact the fruit fly trap seems to work better and better as the piece of fruit becomes irresistibly over-ripe. 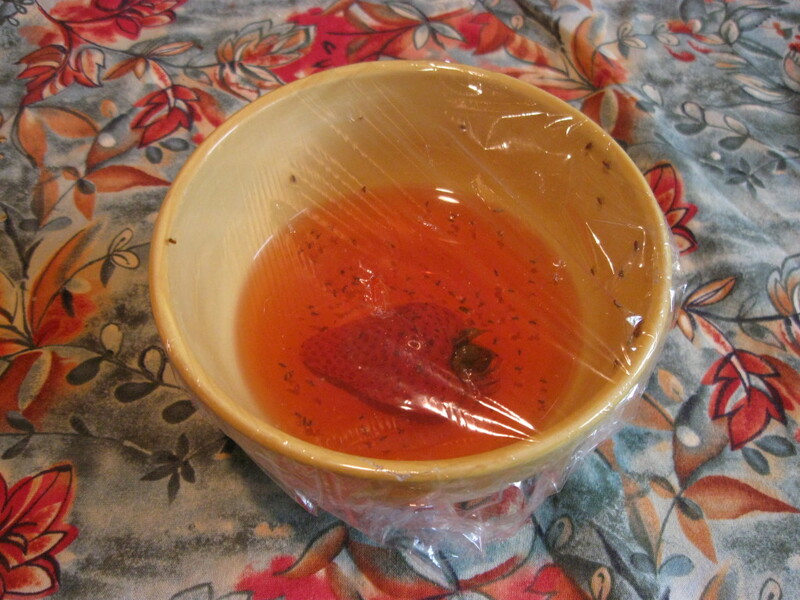 You can catch hundreds of fruit flies with this trap. A single unit will eliminate an entire fruit fly infestation, provided you do your best to remove any other attractants you have lying around the house. If your trap is not catching any fruit flies, your holes might be too small. Make them a little bit bigger by twisting the knife around in one of them. They have to be large enough for a fruit fly to easily crawl inside. Just don’t make them too big or they may be able to escape. Also make sure to put away anything else the fruit flies may be attracted to. Make sure that your trap is the most delicious smelling thing in the house! A fruit wholesaler turned me on to an easily overlooked source of fruit flies is a drain in a kitchen work area, esp the GARBAGE DISPOSAL. his experience was that if the area BELOW THE RUBBER FLANGE RING must be carefully cleaned. the flies love to lay eggs there and it is an ideal egg, larvae, etc incubator.